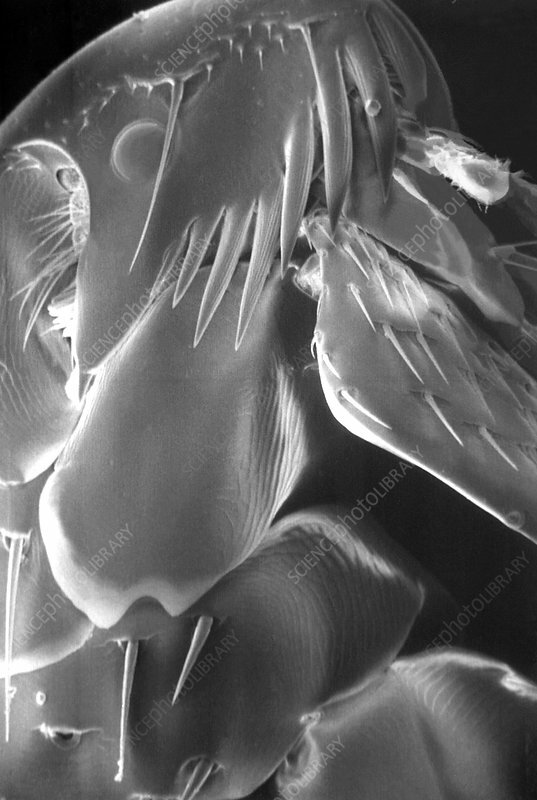 Scanning electron microscopic (SEM) image depicts a right lateral view of the head region of a parasitic flea. Fleas are small flightless insects that form the order Siphonaptera. As external parasites of mammals and birds, they live by consuming the blood of their hosts. Adults are up to about 3 mm (0.12 in) long and usually brown. Bodies flattened sideways enable them to move through their host's fur or feathers, strong claws prevent them from being dislodged. They lack wings, and have mouthparts adapted for piercing skin and sucking blood and hind legs adapted for jumping. The latter enable them to leap a distance of some 50 times their body length, a feat second only to jumps made by froghoppers. Larvae are worm-like with no limbs, they have chewing mouthparts and feed on organic debris. Over 2,500 species of fleas have been described worldwide. Maginification: unknown.